Young Derek is having trouble controlling his transformation. Young Peter tells him to hold an object with the triskelion on it and chant, "Alpha, Beta, Omega." Jumping forward, Kate is also having trouble with her werejaguar transformation in a gas station restroom. Unable to control it and with anyone there to help her, she ends up attacking the man who works at the station. The gang brings young Derek to Dr. Deaton. He doesn't have any clue what's happening so for now, they just have to wait until he wakes up before figuring out what to do next. Lydia decides to stay and look after him and Stiles objects, not wanting to leave her but Scott drags him off. Scott arrives home and finds his dad waiting for him. He stays there when Scott's mother is working a night shift. Agent McCall is trying to have some father-son bonding but things are still awkward and slightly tense. Deaton finds that young Derek's pulse is unusually fast and he tries cutting him and finds that he is healing unusually fast. Young Derek wakes up, confused, and attacks Deaton before running out. Stiles tells Scott about his relationship with Malia, which has come out of completely nowhere. He feels guilty about not telling her that Peter is her birth father. But Malia already has enough to worry about, like catching up in school. Scott and Stiles are called to Deaton's place. The working theory is that Derek isn't just physically younger, but has no memories of his older life. They rightfully assume he'll try going back to his house since he wouldn't remember the fire. He goes and finds it torn down. Police officers show up to tell him he is trespassing. Things get violent and then they tase him. Young Derek is brought into the police station. They check his fingerprints and only the older photo of Derek comes up. Sheriff Stilinski comes in and somehow manages to realise that it is Derek, without fully understanding why or how. It's then that Scott and Stiles show up and help fill in the blanks, but not before he asks if time travelling is real. Scott and Stiles tell young Derek what has happened and convince him to lay low while they figure out how to return him to normal. Scott chooses to lie about the fate of his family but feels tremendous guilt about it. Lydia and Kira pull up to get gas but when Kira realises that Lydia's car doesn't actually need gas, Lydia has already found a dead body and it's the man Kate had attacked at the beginning of the episode. The scene looks like something straight out of Saw. Malia shows up to accompany Scott while he talks with Peter. She says he'll be better protected with her there. Peter is meeting his daughter for the first time but she has no idea why Peter is so amazed to see her, momentarily at least. They have a bit of a sass-off and then Peter learns about Kate coming back to life. Young Derek and Stiles have dinner with Agent McCall and Stiles is awkwardly trying to keep McCall from learning that Derek isn't actually his cousin from Mexico and Derek from learning the fate of his family. Unfortunately, Derek learns the truth about his family. Derek wants to speak to Scott so Stiles leaves him alone for a moment, promising to call scott. But true to form, Kate arrives and steals him away. Peter is able to figure out that Kate changing Derek to that age is because he both knew and trusted her at that age. After learning about and receiving photos of the gas station murder, Peter informs the group that Kate wants the triskelion to help her control her transformation. 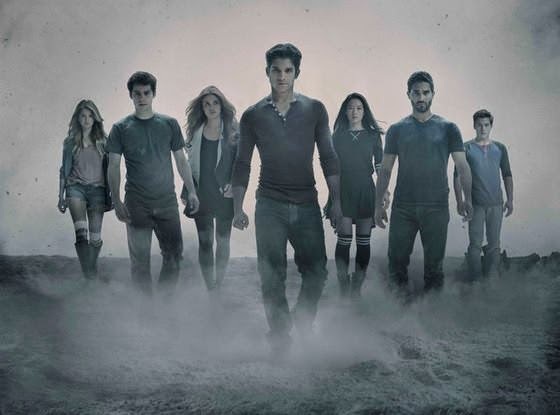 Derek takes Kate to the vault under the school and Peter, Malia, and Scott are following after them. But they run into a new type of monster to face: Berzerkers. Peter pulls Malia back from fighting, saying that with there being only one right now, they can actually get out of there alive. They take off running while Derek recovers the Triskelion. More Bezerkers show up and Scott and Malia are cornered. Peter gets to Kate and Derek, telling her that the Triskelion doesn't have powers and was merely something for Derek to focus on, like training wheels. Young Derek hears Scott fighting the Berzerkers and runs off to help. Stiles and Lydia arrive, with Stiles wielding a baseball bat. Finally, Kira joins the fight, katana in hand. Kira ends up knocked down quickly but then Derek comes and begins fighting the two Berzerkers. Peter is still explaining to Kate that Derek gave up using the Triskelion when he learned to use anger to control himself. He challenges Kate to get angry but then smoke bombs are thrown down into the vault. Kate gets away and Derek begins to transform back into his normal self while still fighting the Berzerkers. A roar is heard and the Berzerkers follow after it. Derek is an adult again but his wolf eyes are now gold instead of blue. Someone goes into the vault while Peter is still incapacitated from the smoke. He tells them to wait as they make off with a briefcase full of bearer bonds. Stiles and Lydia arrive and ask how much was stolen. Peter says it was $117 million.